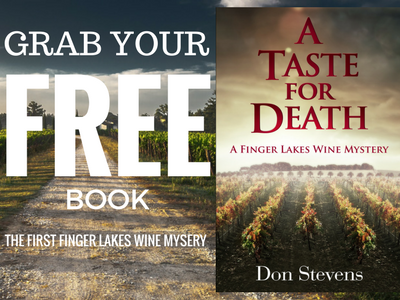 For a limited time, you can get a FREE copy of A Taste for Death – the first Finger Lakes Wine Mystery – direct from this site. Just click the tab below to get started. Welcome to the official site of Don Stevens, author of the Finger Lakes Wine mysteries, a complex series set in the Finger Lakes wine region of upstate New York. Now released, A Taste For Death, the first in the Finger Lakes Wine Mystery series. Visit the Amazon page for more info on ordering. Visit the media room page for an author’s press kit. The Contact Page has a form to ask the author questions (with no visible email to reduce spam).